A cable spool roller is used for rolling large cable spools, for payout, unwinding and take-up of heavy cable. Often used in combination with a tugging or pulling unit, an LJ cable reel roller is equipped with variable speed, bidirectional controls, slip clutches to eliminate over torque and maximize safety, heavy duty rolling components, and easily adjustable diameter range using v-track rollers. 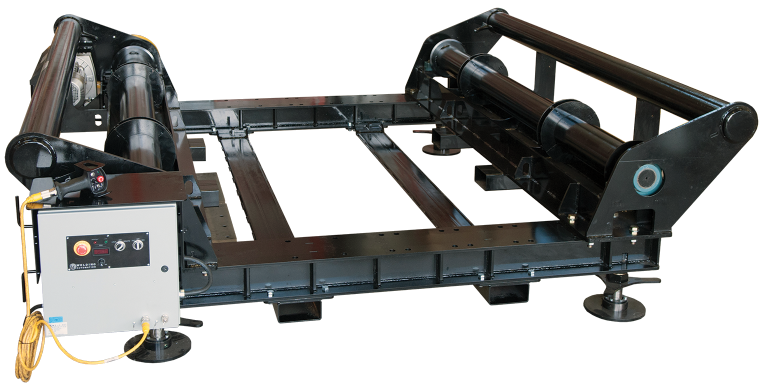 LJ engineers and manufactures cable drum rollers to any capacity or specification required. Footprint: 79" x 95" x29" 99" x 134" x 22" 102" x 156" x 43"